Left Hand Mine is an iron mine located in the Reach, directly southeast of Markarth. Five iron ore veins are found within the mine. Skaggi Scar-Face will buy iron ore from you. * Returns to Kolskeggr Mine after completion of the related quest. Before crossing the stone bridge to the mining camp, a Rock Warbler egg is on the ground to the left. Another is across the bridge to the right. 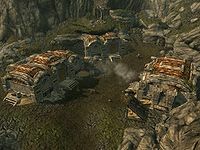 The three buildings that make up the Left Hand mining camp continue the Dwemer architecture of nearby Markarth. Daighre's House and Skaggi's House are on the east side of the camp. Across from the houses is the Miner's Barracks. A goat and some chickens are wandering around the camp, and outside the barracks are two chicken eggs. In the beginning, the settlement shelters two refugees from Kolskeggr Mine who were displaced by Forsworn. Talking to them or Skaggi triggers the related quest. Just outside the entrance of the mine itself is a smelter with four iron ores on a crate. The mine is a small production, containing three active workings. There is nothing of particular note inside other than the iron ore veins and a few alchemical ingredients. The entry goes down past a small side shaft on the right. A few specimens of white cap, imp stool, and bleeding crown are growing at the mouth of this small shaft. The first of the five iron ore veins is found there. The table ahead holds two pickaxes. Behind the empty barrels to the right of the table, more white cap can be harvested. A crosscut divides the mine into east and west. The shaft to the east has three pairs of iron boots next to the shelves and three more pickaxes. On the ground is a basket of six Nord mead bottles and a knapsack containing a potion, and a random piece of jewelry. The end of the shaft widens and there are two iron ore veins; one on the west end and one on the east. To continue to the other end of the crosscut, the shaft to the east has a small table with an iron helmet. Strangely, two red mountain flower plants are growing down here; one on the left side of the shaft and other under the scaffolding ahead. When the shaft opens up, the first iron ore vein is found to the east, just before the scaffolding. There are a number of sacks containing food items in this area. The last vein can be accessed from the platform at the top of the scaffolding. A small table on the platform has some loose gold and a pair of leather boots are by the table. The vein is on the north wall. This page was last modified on 20 March 2017, at 00:12.